I will post as they occur all the stupid things Donald Trump says. The list goes on. The first rule of holes is this: when you’re in one, stop digging. Climate change has devastated our farming, fishing, and forest economies for too long and fossil fuel energy sources continue to make that hole deeper. Earlier this summer, I hosted a panel at the Netroots Nation Annual Conference to discuss meaningful environmental solutions such as the Keep It in the Ground Act, legislation I introduced last November that would end all new fossil fuel leases on federal public lands and waters. This proposed legislation would keep over 90 percent of the potential carbon emissions from oil, gas and coal on our federal lands and federal waters from being emitted into the atmosphere and contributing to climate change. In my opening comments at the panel, I announced my next major initiative to combat climate change: phasing out the use of fossil fuels like coal, oil and gas by 2050. In the next several months, I will introduce legislation that clearly lays out the path to move our country away from fossil fuels and towards a 100 percent clean and renewable energy future by 2050. As we approach the harsh reality of global warming, it’s becoming more and more clear every day: today’s fossil fuel economy will not sustain our environment or our economy for much longer. The impacts of a warming planet are affecting our communities, our economy, our health, and our safety. We must act now with bold legislation that will put us back on track towards a cleaner, brighter future. Some will say that it’s too hard, that we can’t do it. I vehemently disagree. America has shown over and over that if we commit our ingenuity and political will to something, we can change the world. It’s time for that same kind of national commitment and to revolutionize how we use and generate energy. We must work together to Keep It in the Ground, and to reach 100% clean, renewable energy by 2050. Help us spread the message that we need to get to #100by50 on Twitter and Facebook . I just can’t stand hearing the woes of the coal industry and how it’s the only job many of the coal miners ever had. Too bad, as a nation we are tired of all the pollution coal burning causes to our environment and like Hillary said, we will close down coal mines in the future..So what if that’s the only job many of them had, maybe it’s time to learn how to do something else. It happened like that in Oregon, where loggers wanted to completely clear cut every stand of timber, and because of wise conservation, they put limits on how and when the time can be harvested. The forest service and private companies like the coal industry made millions over the decades. You will just have to find another job, join the rest of us who have had dozens or more jobs in our lifetime. The logging industry workers had training supplied by the government, just like coal workers will get with Hillary’s plans. CNN coverage of the poor coal miners, on the side of the poor coal industry that pollutes our air and waters. Just calm down W Virginia and look for other work, our Pacific NW loggers are now working other jobs. and the forests are being run more efficiently, using thinning and forest practices where there is always forests to cut, without clear cutting everything, and killing our old growth. Coal will be phased out, there are renewable energy now with wind, solar and natural gas. Fossil fuels will also be phased out. Get with the program W Virginia and the rest of the states that have coal mines. I don’t feel sorry for the coal companies they have wrecked havoc on our environment and made billions doing it. Obama and a strong coalition of other countries passes Climate pact. Obama and a coalition of other countries just passed historic pact to help reduce carbon emissions. The United States is joining those who believe our carbon footprint needs to be reduced. The report has sparked massive media attention, and has inspired local activists to call for a local investigation. Governor Rick Scott denies the reports, but if we keep the national spotlight shining on Florida, we can stop him from blocking an investigation and hold him accountable for any wrongdoing. 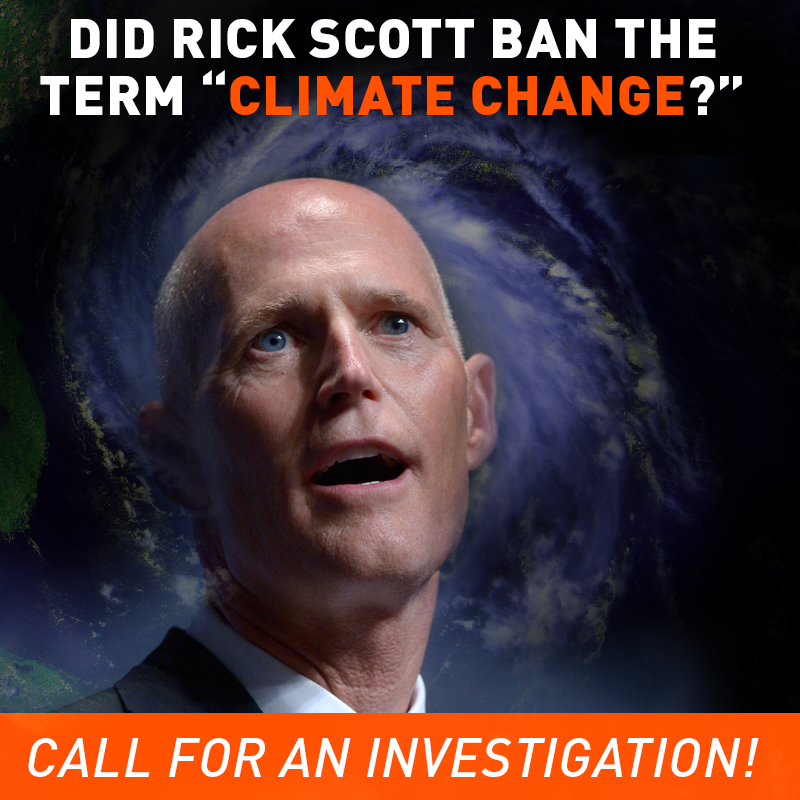 Add your name to support the call for an investigation into Florida’s climate censorship. According to the report by the Florida Center for Investigative Reporting, four former employees at Florida’s Department for Environmental Protection (DEP) were told they should not use the terms “climate change,” “global warming,” or “sustainability” in communications or public reports. The unwritten policy was reportedly implemented in 2011, after Gov. Scott — an outspoken climate denier — took office and appointed a new DEP director. If we don’t act now, this “unwritten policy” could have grave consequences for Floridians. Scientists consider Florida one of the most vulnerable states to the impacts of climate change in the U.S. In fact, scientists predict that sea level rise could wipe out 30 percent of the state’s beaches by 2100. The Inspector General for the DEP has the authority and independence to investigate Gov. Scott’s conduct — and to show climate-denying politicians across the country that they’ll be held accountable for censorship. 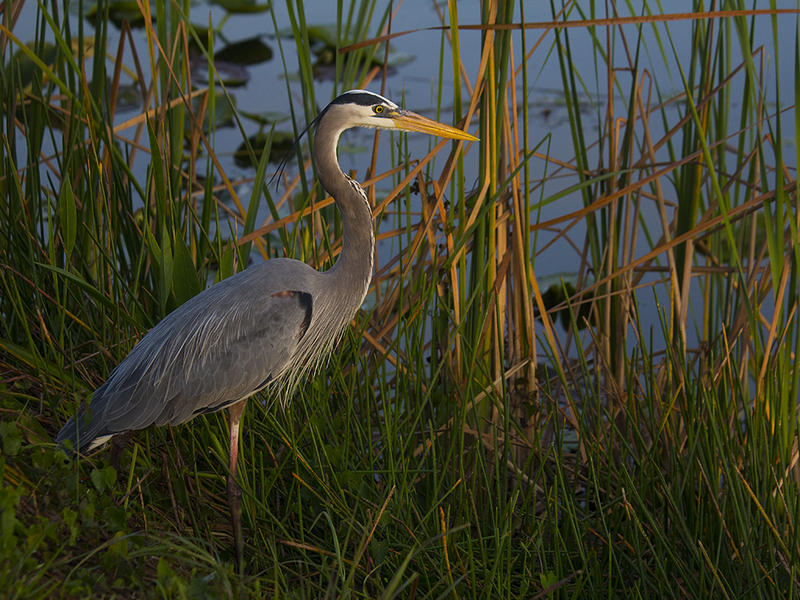 Don’t let climate deniers put Florida in danger. Sign your name now.